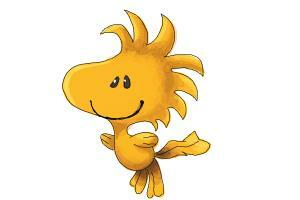 Woodstock is a small yellow bird that is a character in the Peanuts comic strip. He is good friends with Snoopy and lives in the same house as Snoopy and Charlie Brown. If you want to learn how to draw Woodstock, take a look at this art tutorial. Step 1 To start this lesson, sketch the outline of Woodstock. Then draw a horizontal line across the paper, a full body length below Woodstock. Step 2 Draw a question mark shape from the horizontal line to Woodstock, as he is sitting on a small plant. Step 3 Erase some of your early lines and go over the drawing to add the final lines of the drawing. After adding some color, you are finished with this how to draw Woodstock art lesson.